We totally get it: mornings can be tough. The alarms. The “who’s first in the shower” battles. The “Where’s my backpack?”/“I need a ride to school today”/“You have to sign this form by today”/”My hamster got loose”/What can I have for breakfast, the bus is coming!” scenarios we all face can really test our mettle. Especially the breakfast part. Never fear. Here are some ideas that might help make mornings a little smoother, and certainly more delicious. They’re loaded with valuable protein to keep appetites satisfied right up to lunchtime and for an all-systems-go physical and mental boost. Best of all, these recipes would be just as good on a leisurely weekend morning. Choose your carrier: English muffin, bun, soft roll, etc. In a microwave-safe bowl such as an individual-sized ramekin, mix together 1 egg, 1 tablespoon milk, and salt and pepper to taste. Microwave about 45 seconds or until set. Place cooked egg patty on bread. To freeze, let sandwich cool and wrap securely in waxed paper. To reheat, simply take a sandwich from the freezer and reheat in microwave 1-2 minutes or until heated through. Next up, breakfast sandwiches that are best served fresh—but they’re quick and easy enough for busy mornings. 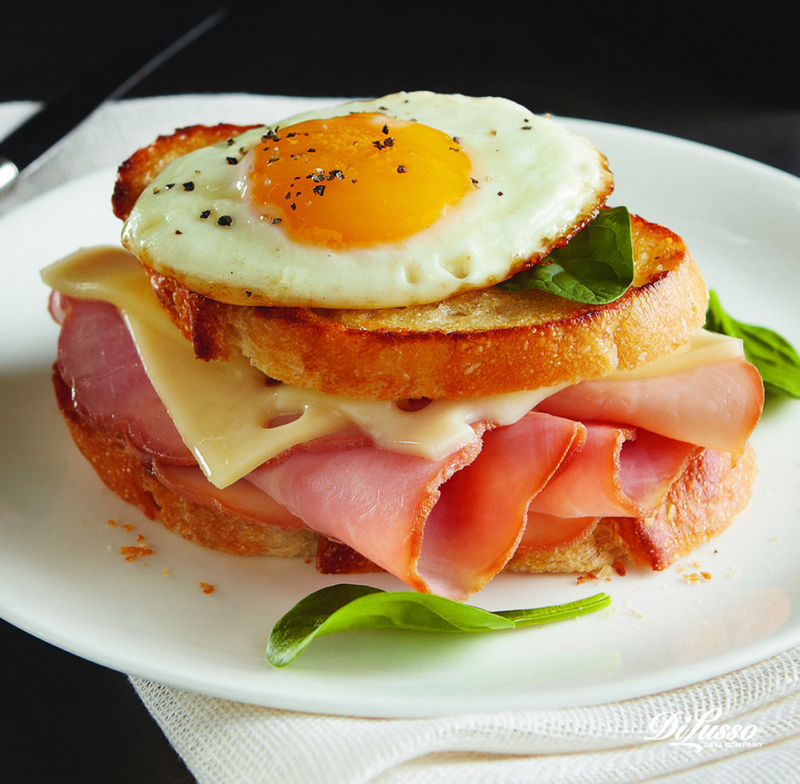 Our Ham and Swiss Breakfast Sandwich is an eye-opening combination of crispy baguette, DI LUSSO® Brown Sugar Ham, DI LUSSO® Baby Swiss Cheese, and a sunny-side up egg. Throw on a sprig of fresh basil to make the morning feel special and to amp up the flavor. 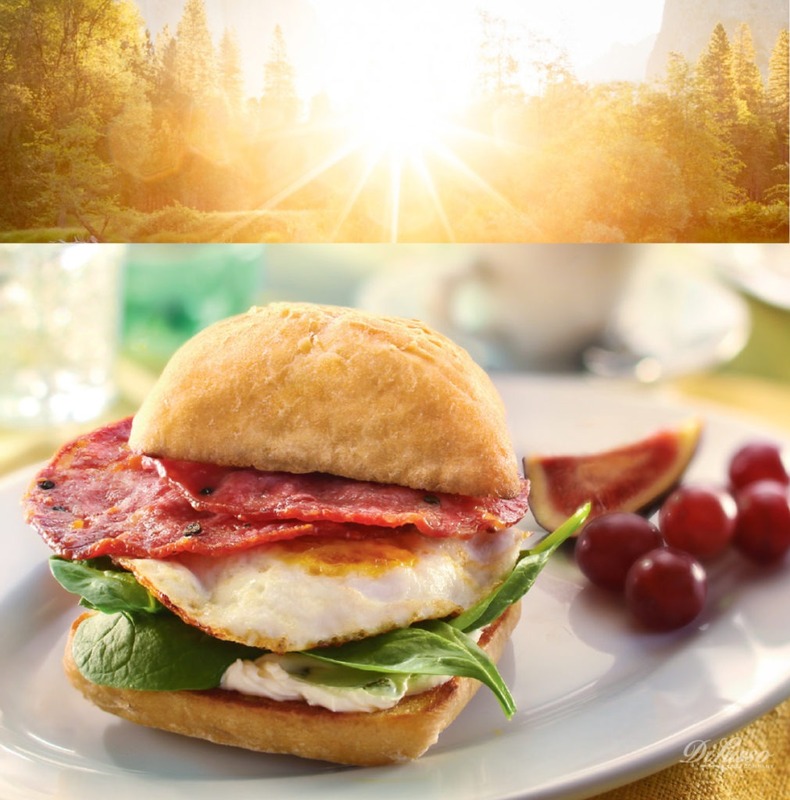 Add a new taste to the morning with the Italian Breakfast Sandwich, a ciabatta roll with herb cream cheese, DI LUSSO® Sopressata, spinach, and a fried egg. Eye-opening deliciousness that will bring sleepyheads right to the table. Breakfast, as we know, is the most important meal of the day. Now it’s also the most delicious. Here’s to that one extra cup of coffee!